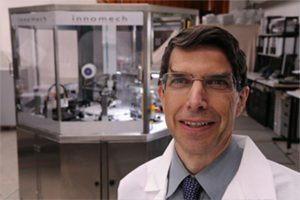 Innomech has appointed Dr Peter Woods – an acknowledged expert in pharmaceutical automation and currently programme manager with the company – to take charge of one of its three business divisions: developing automated manufacturing systems for the assembly and test of medical devices. In his new role, Peter will lead a multi-disciplinary team to design and build automation equipment for developers and manufacturers of products such as drug delivery pens, contact lenses, diagnostic kits and surgical instrumentation. Innomech offers everything from feasibility studies through to large-scale system build and every system is developed in parallel with a detailed validation document package to enable fast and low cost regulatory compliance. The company’s track record includes developing equipment for most of the world’s top pharmaceutical companies, as well as many early-stage technology businesses looking to bring first products to market.